I would like to wish everyone a Very Merry Christmas and a Happy New Year. May your days be merry and blessed with joy, you and your loved ones. 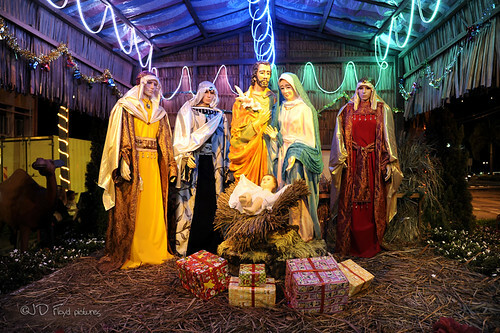 "Nativity Hut" - a nativity scene at Gaya Street Christmas Celebration 2011, where figurines of Joseph and Mary are in life-size. @DoRa Priscilla, thomas, KY Chua - Merry Christmas & a prosperous new year ahead. Wah! Sekarang Wak dah pandai cakap Siam yah. @thomas. Okay, no worries, will remove when I'm free on my desktop/laptop.